There are a lot of winter resident birds around here and Beans is very concerned about them. This may have been partly prompted by the book "Miffy in the Snow" in which Miffy helps a bird in the snow. Her initial question was: "What are they going to eat and can I share my toast? 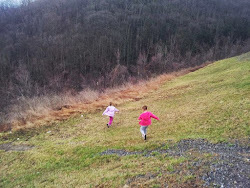 It's getting cold and all their food will be buried in the snow." She’s pretty convinced that chickadees would like strawberry jam (I’m inclined to agree – I mean, strawberry jam is a pretty universally liked food). So the easy answer to that is no, no bread. Bread isn’t very good for birds. It's like bird junk food, sure they like it but it can fill them up without providing the fat they need for winter. The opposite of our junk food, which gives us lots of useless fat. That fat is how they keep themselves warm, so maximising their food intake is key to surviving winter. While there is a lot of wild food available to them and they don’t really need us, winter bird feeding can be pretty fun and a good chance to see who sticks around. So we put up some feeders to ease Beans' mind. 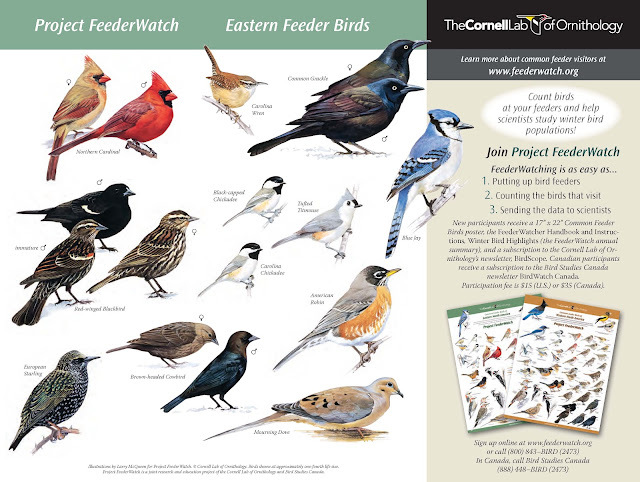 Prompted by this we joined Project FeederWatch this year because it’s never too early to teach your kids how to collect data and I'm nerdy enough to want to do it in my spare time too. 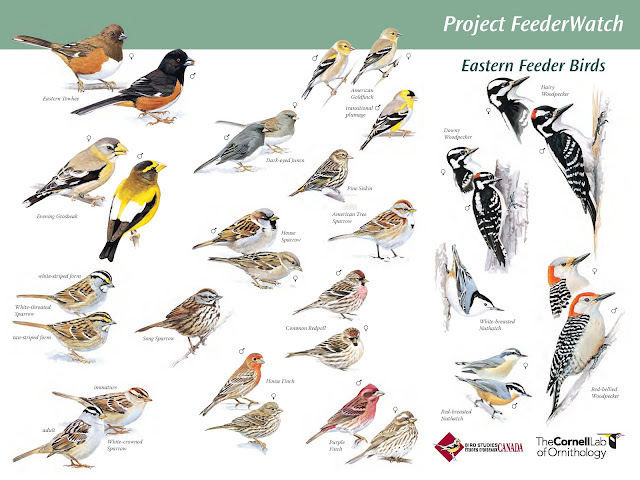 The girls were very excited to get their bird ID poster in the mail. OK... I was excited too. We have a small hanging feeder and a suet feeder in our yard. Suet feeders are a great choice for winter because they have a ton of fat and also seeds – it’s basically a cage that you put the suet pucks into and hang somewhere. Plus with them you can get woodpeckers, and woodpeckers are cool. I suppose if you were really crafty and had a lot of time and fat on your hands you could make suet pucks and a holder, but I have none of those things and my craftiness ends at gluing stuff to other stuff. I also found a few examples where people just tacked big chunks of fat to a board and put that out, which is an option if you happen to have large chunks of fat you were looking to build something with. We do sometimes make pine cone feeders though! Ridiculously easy (just my style) because all you do is take an open pine cone, slap some natural peanut butter mixed with oats or cornmeal on it (I bolded natural here because the birds don’t need sugar and salt and also it’s fun to bold things) and roll it in seeds. VOILA! Fat and seeds – just like the suet feeder. Now that I think about it you could totally use the crunchy peanut butter for extra peanutty-ness. The cornmeal/oats are to make it less sticky and easier to eat, because nobody wants peanut butter stuck to the roof of their beak. If you have a nut allergy in your house (or are opposed to peanut butter) you could do this with lard or shortening or maybe leftover bacon fat – the key is FAT! The nice thing about this project is if you are doing it with little kids it is okay if they eat the stuff (I guess even the lard). Regular bird feeders for seeds can be bought or made out of milk cartons, pop bottles, juice jugs…just hang and wait for birds (just make sure there's no sharp edges). A good tip if you are making them is to make sure you put a few drainage holes in the bottom for water or they fill up if it rains (we discovered this the hard way unfortunately). It’s also important to remember that seeds can become mouldy and poisonous if they are wet, so change them often. They are also hard for the birds to get if they are frozen in a solid chunk of ice (yep, hard way again). You can also just fling some seed out on top of the snow on a nice day and see who shows up. The best all-purpose seed is black oil sunflower seeds (not the stripey ones) as it's a favourite of a lot of birds. A handy-dandy chart of who eats what! OK. Now, it’s all well and good to give them peanut butter and sunflower seeds, but it doesn’t really answer Beans’ real question – what do they eat in winter in terms of wild food? Bird feeding is a relatively new phenomenon and birds have been around for a loooong time, so I’m sure they made it through a few winters on their own. While habitat loss, particularly in urban areas, does make it harder for them there is still a fair bit of food out there. Insectivores will dig out hibernating beetles, larvae and grubs from under tree bark. Woodpeckers are still actively tapping away for bugs. Grass seed is still available from those of us who don't mow much and in fields (although harder to access once the snow stays) as are a variety of berries and seeds in woodlands. Poison ivy is actually a great source of food as the fruits (a drupe for those who read the fruit post) stick around all winter. The reaction to the urushiol oil that makes us so itchy is a human-only thing, birds find poison ivy delicious. mmmmmm...anyone for poison ivy jam?